The Central West Ballet Academy offers a growing syllabi of dance styles, emphasizing on classical ballet as well as other forms such as Tap, Jazz, Character and opportunities for experiencing the stage in numerous ways. From the introductory levels to the advanced programs, the students have the chance to be mentored into such classics as The Nutcracker and later on, in creative story ballets such as Legend of Sleepy Hollow, Peter and the Wolf and other special performances. Above all, the Academy focuses on correct posture, introduction to the basics of ballet technique for the young and a gradual formation in classical ballet, including an in-depth knowledgeable approach to pre-pointe and pointe shoe training. The students are immersed in a creative and inspiring environment enabling them to set personal goals and consider an avenue for a training track into CWB II, a trainee company program leading into the main Central West Ballet Company. We maintain small class sizes to ensure that every student receives individualized attention. Students are taught by an accomplished staff made of current Company members under the professional leadership of Leslie Ann Larson, Director of the Academy. Preparing to go on stage. Handing down the recipe for success. A team spirit, on and off the stage. Leslie Ann Larson’s meticulous approach to the art of dance is backed by a long and solid career. Born and raised in Southern Oregon, Ms. Larson was fortunate to train on a full scholarship at The Dance Laboratory, a small prestigious school in Seattle, Washington. There, she trained with distinguished teachers Charles Bennett of the American Ballet Theatre and Flemming Halby of the Royal Danish Ballet. With Bennett, Ms. Larson developed a conscientious work ethic and dedicated professional attitude. With Halby, she acquired a full danish technique and style. Ms. Larson was also mentored by the great flamenco artist Sara De Luis over a period of two years. She then earned a full scholarship to The Joffrey Ballet School in New York, where she trained under Joffrey Alumni Francesca Corkle and Trinette Singleton. In her 20 year dance career, Leslie Ann Larson was a member of Oakland Ballet under the direction of Ronn Guidi, where she was instilled with a tradition of the famed Ballets Russes repertory. She then joined Ballet West in Salt Lake City under the direction of John Hart CBE and Jonas Kåge. Under John Hart, Ms. Larson received a complete artistic formation directly from the Royal Ballet tradition. She also learned from great Ballet Masters Elaine Thomas and Denise Schultz. 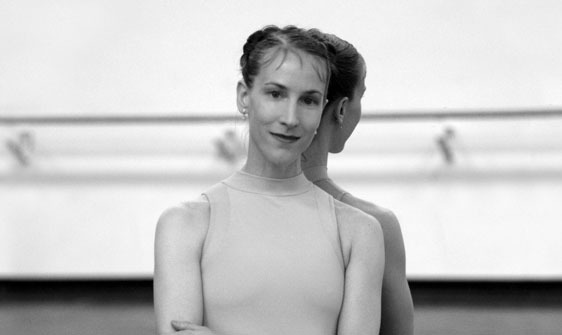 Ms. Larson has mentored numerous ballet students in technique and proper pointe training. Her expertise in all facets of training is backed up by a long teaching experience. Known for her positive implementation of dance ethics, Leslie Ann Larson produces students with an accent on clean technique and safe training.